A weak economy is forcing brides to be extra frugal, so Filene’s Basement has added a second Running of the Brides® Sale in Chicago this year. Hundreds of brides-to-be are expected at Filene’s Basement’s legendary Running of the Brides® sale in Chicago on September 16, all planning to engage in a little smart spending and a lot of fun. When the doors open at 8:00am many brides-to-be and their helpers will literally pounce on dresses priced from $249-$699 that might otherwise cost as much as $9,000. An annual event in Chicago for the past seventeen years, the Running of the Brides® is going semi-annual this year. The second date was added because inquiries about the event have risen dramatically, according to store manager Debbie Chapman. “When the economy shrinks, so do wedding budgets. Couples have to squeeze more out of every dollar,” she said. “A bride who shops here can save big, without sacrificing quality and style,” said Chapman. According to The Knot, Chicago ranks eighth on the list of most expensive cities in which to hold a wedding, with an average cost of just over $35,000. Couples are scrutinizing every line item, looking for ways to save and still have the wedding of their dreams. Shopping for a wedding gown at the Running of the Brides® involves some time-honored rituals. Once inside the store, brides and their helpers are known to strip the racks bare in less than 90 seconds, then strip down to leotards, sports bras or even underwear to try on gowns right there on the sales floor. If it doesn’t quite fit, the experts from Chicago’s Davis Imperial Cleaners will be there to help, and the bride can still come out way ahead. But what happens if a petite bride snagged a size 14 dress in pink chiffon when she really wanted a size 4 in white satin? That’s when the real fun begins, as the women start bartering to find the right designer or size. It’s a ritual that turns Filene’s Basement into an old-fashioned bazaar. For brides who don’t like crowds there are plenty of great deals to be found later in the day when things calm down. Whether you want to be there at 8:00am for the ‘rush to the racks’ or you plan to arrive later, bring a camera—veterans of this sale agree it’s an experience worth preserving. The Running of the Brides® sale takes place Friday, September 16, 2011 at Filene’s Basement, One N. State Street, Chicago, IL, 312-553-1055. Hours are 8:00am to 9:00pm. Checks, credit cards and cash are accepted. All sales are final. 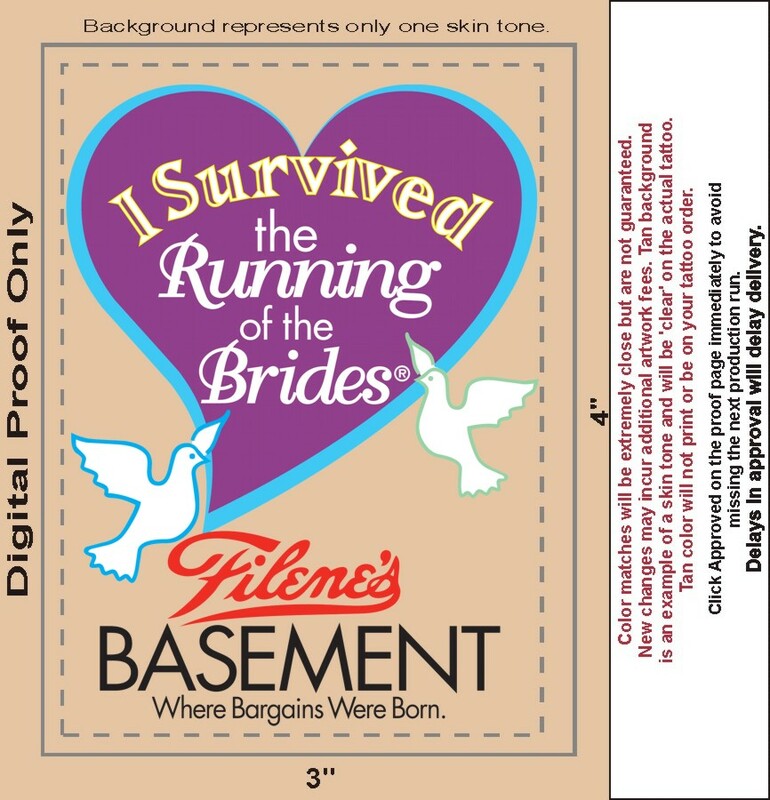 For more information visit http://www.filenesbasement.com/running-of-the-brides.